For those of you who live in Southern California, you know how wonderful the Aquarium of the Pacific is - Filled with tropical fish, sharks, otters, penguins, and my personal favorite jellyfish. As members of the Aquarium we visit often and always learn something new with the many hands-on discovery labs and interactive exhibits. This Halloween the Aquarium is transformed into Scarium of the Pacific for two days. During this special event your family can explore the creepy creatures of the deep along with magic shows, face painting, and of course a costume contest for the kiddos. There will be spooky storytelling and underwater pumpkin carving - this I have to see! 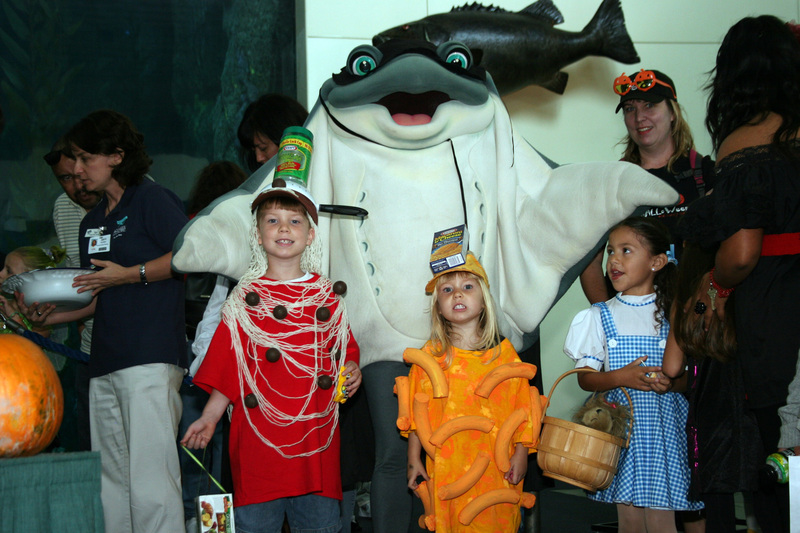 Throughout the aquarium there will be Halloween activities and treats for the little ones. You can print out this coupon and receive FREE admission if your child is in costume during Scarium of the Pacific. Aside from or regular visits to Aquarium of the Pacific, the special events are a must for my family. We have attended lectures, special member only late nights, whale watching trips, and had the opportunity to preview new exhibits. So when I was asked to give away 8 tickets to this special Halloween event I couldn't resist the chance to share my families love of the ocean with others. There will be three winners for this giveaway. Scarium of the Pacific is sure to be a day filled with more fun than fright for the whole family. Scarium of the Pacific is included with paid admission - $25.95 adults (12+), $22.95 seniors (62+), $14.95 children (3-11), and free for children under age 3 and Aquarium members. Winners will be selected using Rafflecopter. Due to the time sensitive nature of this giveaway, I reserve the right to draw another winner if I am unable to get a mailing address in a timely manner. Giveaway is only open to residents of the contiguous US. Please make sure I can contact you to notify you if you have won (leaving a valid email address in your comment is a great way). Winners will first be announced on Life with Dylan's Facebook page, so if you're not a fan of us on Facebook, you may not know if you win. what a fun Halloween treat. I would love to take the boys. I LOVE when places like zoos and aquariums do holiday events like this! I have never been but I imagine they have dolphins! What a fun surprise for the kids! Would love to take a family outing to the Aquarium. We've never been before. Macaroni and cheese costume?!?! Genius! !